A seventy-three-year-old woman—let’s call her Dorothy for the sake of this story—was understandably apprehensive. She had just been told that she needed an eight-level spine fusion from her tenth thoracic vertebra to her pelvis, so she came to me for a second opinion. Dorothy was a retired National Guard armed service member. Although she was not in the best physical shape, she was moderately active. Golf was her passion. This is an example of a 12-level fusion from the 4th thoracic to the 3rd lumbar vertebra. Once the spine has healed, it is permanently stiff where it has been fused. Two years earlier she had developed pain down her right leg and weakness of the muscles that elevated her right foot, a condition commonly know as “foot drop.” She underwent a surgery called a laminectomy between her lumbar 3-4 and 4-5, to take the pressure off the nerves. Her leg pain quickly resolved, but the damage to the nerves causing the foot drop was permanent; so she wore a brace to keep her foot stable when she walked. Normally, foot drop cannot be reversed with any surgical procedure, since the damage has occurred inside the nerve. Dorothy’s symptoms now consisted only of the persistent foot drop, and she was able to walk easily with the brace on her lower leg. Her spine was straight and she had no pain in her back or legs. I looked at her new MRI scan and it showed that the surgeon had successfully taken the pressure off the nerves to her foot. There was some generalized arthritis; but there is no correlation between spinal arthritis and back pain, as those of you who are familiar with my website have heard me say before. If you are wondering, “Why would she need another surgery?” you are following a sound train of thought. We know that damage to the nerves causing foot drop is permanent, so how could more surgery help? Even if the prior surgeon had left some bone spurs behind, more surgery still would not improve the chances of the foot nerves regaining function. The surgery can take up to 10 hours. You are in the hospital for 5 to 7 days—longer if there is a complication. The complication rate is over 70%, with significant chance of problems such as infection, paralysis, blindness, hardware failure, screws damaging nerves, blood clots to the lungs, and death. The fusion takes around four months to heal. Your overall strength does not return for months. 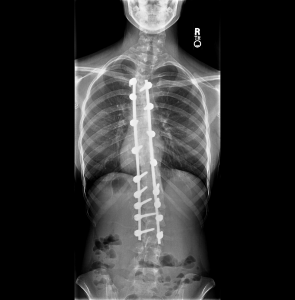 There is a 30% chance that the spine breaks down over the rigid rods. There is a chance that a fusion of this magnitude will cause long-term back pain. You lose all flexibility in the area of the spine fusion. Dorothy would lose much of her ability to twist (Think of her golf game) and it will be more difficult to perform simple tasks such as bending over to tie her shoes. I could go on about this operation and its downsides, because I perform it often—but only for tumor, infection, fracture, or if a patient is bent over and cannot straighten up. Words cannot describe how gratifying it is to return a person’s ability to stand up straight. However, over my thirty-year career, I have gone through every possible complication with patients who have undergone this surgery. Eventually we reach a good result, but not without a fight. For Dorothy, the risk was high and the benefit was zero. I recommended no further surgery. The frequency of these operations has risen in the last few years. Be careful.